Screenslaver may look like your typical villain, and he certainly seems dodgy. His sleek black outfit and high-tech goggles make him the perfect enemy of the Supers since he looks very much like an evil person. However, Screenslaver is only a victim of the real villain as well. He was acting as the distraction when in truth, the man under the Screenslaver mask was being manipulated as well. Screenslaver looks like a modern-day villain in his tight-fit, all-black ensemble. He wears a long-sleeved black top, black pants, black shoes, black gloves, and a pair of cool black hypno-goggles. 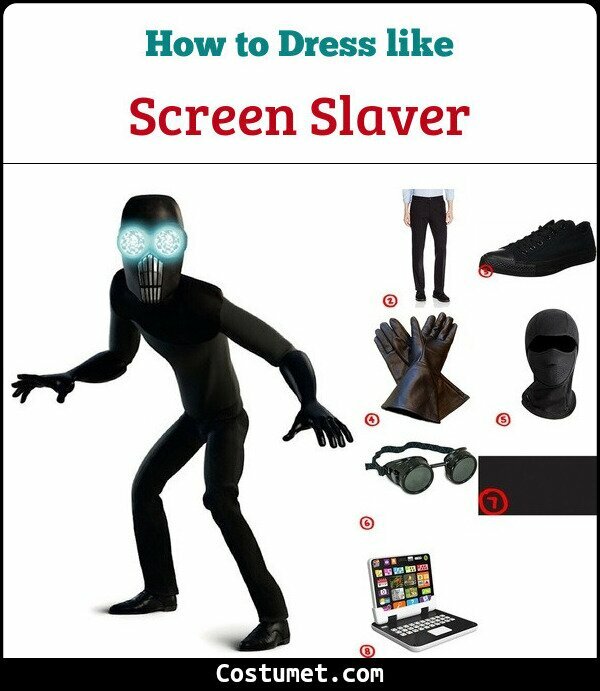 Here’s everything you need to look like Screenslaver. 1 Black Long-Sleeved Compression Shirt Wear this black long-sleeved compression shirt to mimic Screenslaver’s outfit. 2 Black Pants A pair of black pants is a good match to Screenslaver’s top. 3 Black Converse Running around to avoid the Supers mean having to wear a comfy pair of shoes. 4 Black Gloves No fingerprints left is standard protocol for villains who want to succeed. 5 Black Balaclava Wear a black balaclava to hide away your real identity. 6 Goggles Wear costume goggles as part of your Screenslaver costume. Paint the lens a sheer mint green color to make it look like hypno-goggles. 7 Craft Foam Use this craft foam to make Screenslaver’s custom mouthpiece and paint it silver. 8 Fake Laptop Bring along a fake laptop since Screenslaver needs it to transmit his evil plans. Screenslaver was voiced by Bill Wise. The Underminer’s clothes look very much like a miner’s uniform. He has on a yellow long-sleeved shirt, brown overalls, a brown/green cape, brown boots, a miner’s hard hat, and mechanical hands. He also loves quoting things with his retro microphone.